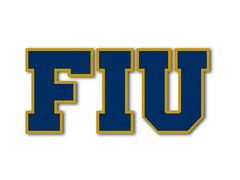 FIU held on to beat FAU on the road last night. A ten point lead shrank to a two-point lead in the last minute of the game and FAU missed two layups to tie it... But we won. Yikes. FAU will travel down to Miami to take on the Panthers this Saturday at 7 pm. Should be a fun game. This team is playing pretty solidly. For all the (valid at the moment) concerns we had about this team, since we played such an easy schedule to begin the season, the truth is that this team has grown as a cohesive unit playing this difficult style of game. We are a much better team that at the beginning of the season, and people can't come up with excuses anymore not to support this team. Very close games vs. some league top teams, a win at WKU, and beating FAU always validates a season. The only bad in-league loss so far this season was against another top team in UAB. At 13-7 overall and 4-3 in-conference, I will take it so far. Saturday at the OB Convocation Center in FIU is a big rivalry game vs. FAU. Let's make it there! Round 2 of this year’s back-to-back games vs FAU is tonight at FIU’s Ocean Bank Convocation Center. Full of activities at FIU today, as the Next Horizon Capital Fundraising Campaign officially goes public with free food, and several events. This all leads up to a tailgate prior to the basketball game, and to add things to tonight, the football team will be honored for their season and Bahamas Bowl championship st halftime. There will be several of our top football recruit targets for this coming National Signing Day in attendance as well. A good time helps FIU all around. Try to attend today’s/tonight’s activities. Should be fun. Go Panthers! Round two was an unfortunate loss, but the silver lining was the huge crowd! Pretty Ana I gotta crowd. I did not expect to see it packed, but it was filled to the tilt! Great atmosphere indeed. Too bad we had that second half. True, you'd like to see a win in that atmosphere. Hopefully the loss doesn't deter the fans to show up again. A chance to bounce back at home against Southern Miss this Thursday. Hope the students come out in numbers again! You can't coach height and muscle. He needs some beef. Maybe next year.